Imperial Glasgow Wedding Cars - About Imperial Glasgow Wedding Cars. Providing wedding services for over 15 years. Imperial Glasgow Wedding Cars have been providing wedding car services for the lucky couples starting a new chapter in their lives. At Glasgow Wedding Cars, we saw a lack of quality and exceptional service related to wedding cars service providers and decided it was time to change things around! To meet the demands of those who wish for their wedding day to be extraordinary, we started our company to provide our clients with an individualised one-of-a-kind service they truly deserved. With over eight years of combined experience, our focus is to ensure that your Chauffeur driven vehicle, whether it is the Limousine or the VW Camper, meets the level of quality, comfort, and pleasure you have always wished for! We offer luxury chauffeur services throughout the Glasgow, East Kilbride, and Paisley areas. To meet the unique demands of our clients, we offer tailored packages to suit the individual needs of your special occasion. To showcase our level of commitment and quality service, we offer the finest Wedding Cars in Glasgow. Our fleet includes the gorgeous silver Chrysler 300 (also known as the Baby Bentley), VW Camper and the Beauford Bridal Car. We assure you, these are some of the finest of wedding vehicles not just in Glasgow but all of the UK. After all, we wish for your special day to be perfect in every way possible. We compliment this day by giving you are fully-uniformed chauffeurs (the perfect gentlemen!) with bridal umbrellas (just in case!) and wedding flowers (your favorites!). 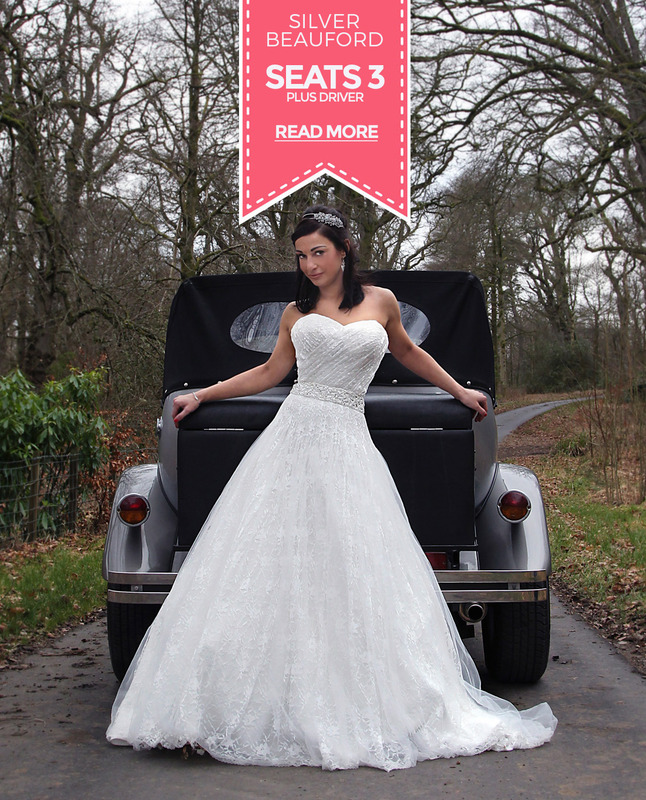 Why not visit us and have a look at our fleet of Wedding Cars in Glasgow! This will give us the perfect opportunity to get acquainted as well. Rest assured that once you have a look at our elegant, stylish and luxurious cars, you will want one (or more!) to be a part of your wedding day. For quotes and bookings or anything you wish to ask us, please do not hesitate to give us a call. We will be more than happy to talk with you! Among our fleet of Wedding Cars in Glasgow, the VW Camper is the most exotic and well-traveled one. Even though she had been used as a taxi in Sao Paulo, Brazil, we had her shipped here to the UK all the way from there so we can give her the special treatment. After going through extensive detailing and a renovation project, we were able to restore her back to her former beautiful self. 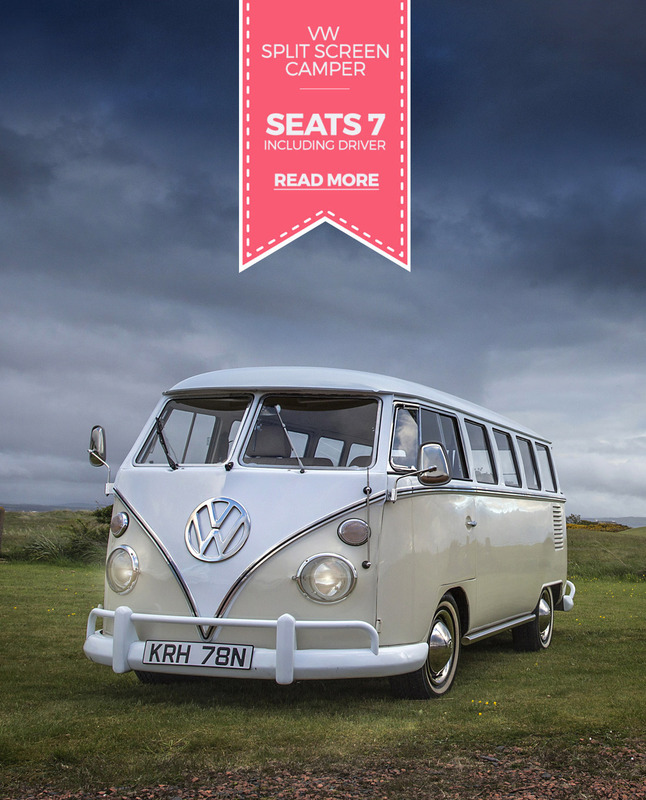 For a couple looking for a wedding car in Glasgow that showcases uniqueness and real character, our VW Camper is the best choice! 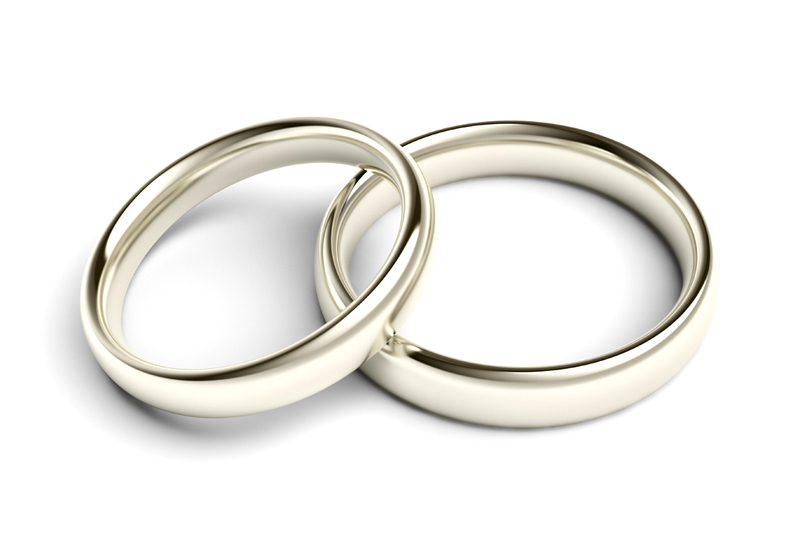 We complement our vehicles with an emphasis on quality service, ensuring that your wedding day is truly special!